I get really excited about setting the table! I’m not good at cooking the food, but I’ll spend hours thinking about and finding the perfect table linens, dishes and decor! For Thanksgiving I wanted a clean white and natural look. 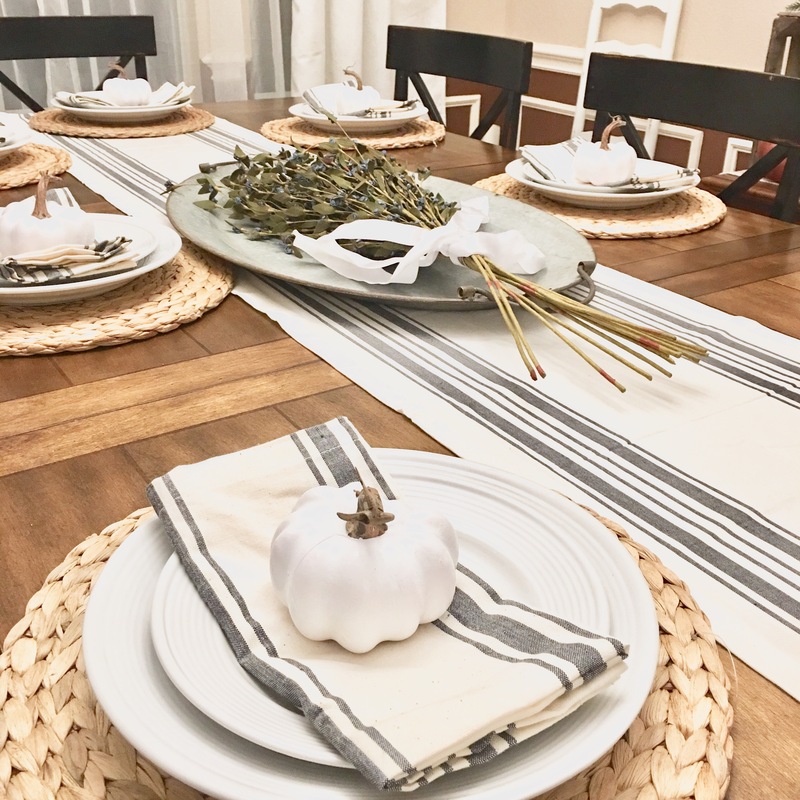 These wicker placemats and linens were a showstopper at World Market! I had to go to two different stores to buy enough, but grabbed a friend and giggled while we late-night shopped! I found these pumpkins for 80% off at Hobby Lobby. (Savings tip: Stores try to clear out their fall decor before Thanksgiving to get ready for Black Friday. Watch for big discounts during the 2nd and 3rd week of November!) These pumpkins were orange, but look how they brightened up with some spray paint! I paid $.60 a piece for them! Score! The centerpiece and flowers were found at one of my favorite boutiques at the trade days in Canton. I think we’ll opt for paper napkins when the big meal happens… but we’ve left the table like this for a few days now, and have all enjoyed anticipating our Thanksgiving feast! Hope your holiday is filled with plenty of food, fun and joy!